There are more than just animal guides to help you on your journey. Your other guides can take a variety of forms, including ancestral. Do not be surprised if it takes time to meet one, however, as they often change or only appear during great times of need. Ancestral guides are those that have a direct blood link to you. Sometimes this can be someone we knew growing up, but more often than not it is someone we have never met. The reason for this is our relationships with ancestors we knew in life are fraught with emotions, making it difficult to form a student-mentor relationship. If you are looking for advice from your ancestors, you will visit the Middle Realm to do so. Depending on how you travel, you can move forward or backward in time, so pay close attention to language and attire when communicating with your ancestors. Your ancestors can provide insights into past and present traumas, provide you with wisdom beyond your years, and help you make difficult decisions. Generally, they will appear if they feel a strong connection to you and your current plight. Simply state your intention of wishing to meet with an ancestor to discuss a particular matter (be specific) and ride. A word of caution on traveling to the Middle Realm. This is our realm, but the spiritual aspect of it. You must be wary of anyone you meet there, even if they claim to be your ancestor. Those we meet in the Middle Realm can be tricky. If the same entity appears multiple times within the Middle Realm, this may be a sign they are in fact an ancestor and a guide. If you have any doubts, speak with your animal guides. There are a number of other spirit companions you can meet in the Otherworld, including teachers, nature-spirits, and guardian angels. Teachers, or learning-based spirits, are spirits who are highly advanced and have no particular tie or affinity to you but simply want to expand their understanding of something in particular, meaning they are trying to learn from you while you are learning from them. This relationship is a two-way street, an "I'll scratch your back if you scratch mine" kind of scenario. These companions can appear in any realm but are more likely to show up in the Lower or Upper Realms. Do not be surprised if they show up as a Native American, an older man with a beard and robes, or a crone. As clique as it sounds, our humanoid companions often show up in a form that is comfortable to us. Merlin, anyone? Nature-spirits are those spirit companions that are associated with some major aspect of ourselves. For example, if you are a very earthy person, you may find Earth spirits showing up in the Lower and Upper Realms to help guide and protect you. Guardian angels are found almost exclusively in the Upper Realm and take on a more ethereal form. These tend to be beings of light whose sole purpose is to protect you while you travel. Often times these beings will not make themselves directly known to you. They may come to you in the guise of a different companion or you may never meet them at all. Please do not be surprised if you do not meet any of these companions right away, or go months without seeing any other beings but your animal guides in the Otherworld. It takes considerable time and experience to begin seeing other beings in the Otherworld. As it stands, I've seen a water spirit, a group of Native Americans hunting buffalo, a demon-like figure, and a flurry of ancestors. In the grand scheme of things, that is not very much. 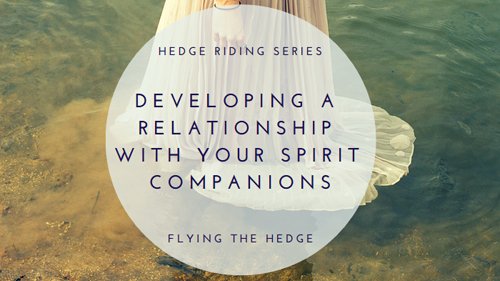 An important part of hedge riding is to develop a lasting bond with our guides. This means those relationships need to be nurtured so they may blossom and grow into a beautiful companionship. There are several ways you can nurture these relationships, but the easiest way is to check in often, not just when you need something from them. This can be done daily or a couple times a week. Simply put aside 10-15 minutes to quickly travel to your garden or the Lower Realm and check-in with your guides. This is the equivalent of making a regular catch-up phone call to a friend or relative. As a result, these exchanges can be short and informal but informative. Consider asking how your companion is, thank them for coming, ask what they are observing in spirit, see whether they have any local news or gossip, and/or ask if they can give you any feedback on your day. This may seem pretty basic, but these short social interactions are important in building a lasting relationship. It is important to note, however, that our relationships without companions are not strictly two-sided. We cannot relate to what they have been doing with their "time" just as they are not able to relate and comprehend what we have been up to, but the point of the interaction is to reciprocate care and attention that they routinely give us. Giving your full attention to the matter is just as important to your guide as it is in conversations with your friends. While your guides and companions may change over time, they very rarely leave entirely. In fact, you may find you only have one or two central companions, with others coming and going as needed. If a guide disappears, keep in mind that you may no longer need them, so another guide is stepping up to assist you, but the other companion will still be available if needed. However, there are some circumstances when a guide may leave indefinitely. These may include you committing murder, engaging in a vicious assault, suddenly becoming mentally unstable, or having a sudden, dramatic accident or illness. These are situations which may prompt a guide to leave, but only because there will be another guide who is more able to assist you. Your guides will not bail on you because they dislike you or find you too difficult to work with. They are simply wise enough to know when they have reached their limits and will hand us over to another "professional" with the deepest love and regret. No matter what happens, you will always have a companion.